This apple was originally developed by J.E.L. Cripps of the Western Australian Department of Agriculture in the early 1980s. 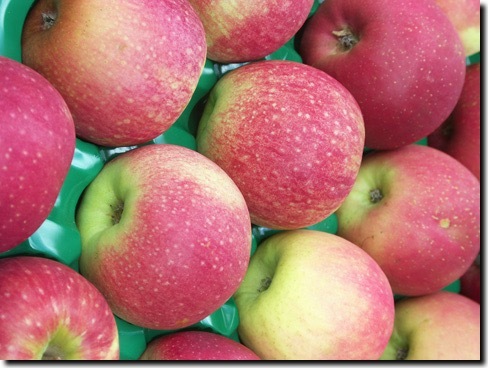 A cross between a Lady Williams and a Golden Delicious, Pink Lady™ is a registered trademark of the Australian Apple and Pear Growers Association, Inc. Very distinctive in flavour and colour, Pink Lady™ apples offer a delicious sweet-tart taste and a crisp slightly dry firm creamy-white flesh. This apple's tender skin has a pink to reddish-pink blush over a yellow background. Pink Lady™ apples pair well with fresh strawberries, pineapple, kiwifruit and mango for refreshing fruit salad. Good for eating out of hand and cooking or baking, this grand apple makes tarts, pies, dumplings, cobblers, tortes and sauces. Sliced or cut apples stay white longer if put in a bowl of water with two tablespoons of lemon juice. To store, keep apples in the coldest part of the refrigerator. This apple freezes well.